The anticipation and excitement for Winter Formal proved well worth it as everyone’s “Once Upon A Time” ended with a “Happily Ever After.” Winter Formal is always a magical Louisville night that brings all the classes together in celebration, and it seems to be the only thought on the minds of many Louisville girls for weeks leading up to this wonderful event. Many plan out the whole night starting weeks before trying to find a perfect dress to wear to one of the most anticipated Louisville nights of the year. Louisville ladies then dedicate hours to preparing for Winter Formal. With everyone looking their best it was a strong contrast to the sweats and polos that we have grown accustomed to. Seniors enjoy the wonderful “Once Upon A Time” theme at their last Winter Formal. Louisville ladies entered the picturesque grounds of the Odyssey, and upon entrance they felt as though they were walking into a magical forest. Each table was expertly decorated to resemble a specific fairy tale which was a unique spin to the standard same design at each table. This fairy tale-inspired winter formal transported Louisville students back to their favorite childhood stories. With beautiful ivy arches and pastel colors throughout the room, the Odyssey was transformed into a compilation of everyone’s most beloved stories. They quickly left their seats to visit with their friends and to meet new people. Eventually it was time for everyone to line up for the scrumptious buffet. Students enjoyed the delicious chicken marsala and the marinara pasta. Roasted potatoes, green salad and yummy rolls balanced off the main dishes perfectly. During dinner, magical Disney melodies played as people ate. Dinner was finished with a fantastic sundae bar with a great variety of delicious toppings. Students could add whatever toppings they desired to chocolate or vanilla ice cream or sometimes a mix of both classic flavors. After a spectacular dinner, Louisville ladies hurried onto the dance floor to dance the night away. The DJ did a fantastic job of mixing it up with classic tunes, top 40 music and slow songs. The DJ played songs that everyone knew and loved, so after a night of dancing many walked away with throbbing feet. 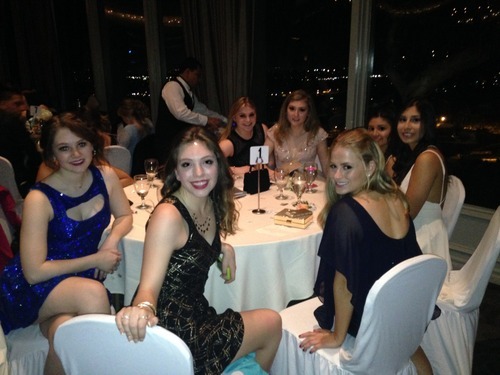 Winter Formal 2015 had everyone wishing the night was longer, so it is fair to say that it was a big success!